If you’ve been using a butter knife to scramble your eggs, then this kitchen gadget is for you. Finally, thanks to the Shake Me Egg Shaker, there is a simple method for making scrambled eggs. 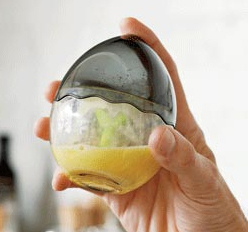 Just crack up to three eggs into one half of the egg-shaped device, close and shake. A Y-shaped protuberance inside of the capsule separates and scrambles the eggs. So put away those rocks, canned goods, salt-shakers, fingers and whatever else you’ve been using to scramble your eggs, and do it properly; the right tool for the job, I always say. UPDATE 7/9/12: Sold out (or at least no longer available) at the link above. However! Today is your lucky day! The Zak Designs D Circle Egg Shaker is still available on Amazon for all your egg shaking needs! Phew!